This Crochet Chick pattern is perfect for easter or spring decorations. The quick and easy free crochet pattern works up in about 30 minutes and will be a great easter basket filler for any child. 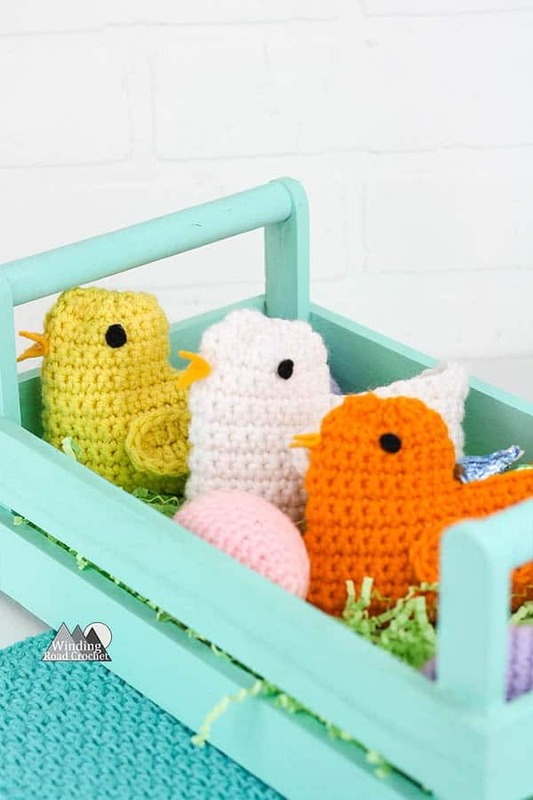 Fill this crochet spring chick basket with easter candy to be enjoyed by everyone. I was inspired to design this pattern after seeing a little knit chick basket on pinterest. That basket was worked as a flat piece and sewn together. I wanted to make a crochet chick pattern that was beginner friendly and did not require a lot of sewing. Very little sewing is used in this pattern and you can even glue some of the pieces on instead of sewing. I always have some Red Heart Super Saver on hand. It is a durable yarn that is great for seasonal projects. The little baskets take up such a small amount of yarn and work up so fast. You can easily complete a few in a single evening. Don’t forget to check out all my Free Crochet Patterns. Finished Spring Chick Basket measures 5 inches by 4 inches. R12: Ch1, turn, Sc in the next 17 St. Hdc in the next St, work 2 Dc in the next St, Work 2 Dc in the next St, Hdc in the next St. Sc in the next 17 Sts. Slst to the first Sc. R13: Ch1, turn, Sc in the next 10 Sts. Skip the next 20 sts, Sc in the last 10 Sts, Slst to the first Sc. R14-19: Ch1, turn, Sc in every St around. Slst to the first Sc. Fasten off after Row 19 leaving a 7 inch tail. Use this tail to sew a gathering stitch around the top of the head. Pull tight to create a curved head and sew the opening shut. R1: Sc in the second Ch from the hook. Sc in the next Ch, Hdc in the next 3 Ch, Dc in the next Ch, work 6 Dc in the last Ch, Working down the opposite of the Ch, Dc in the next Ch, Hdc in the next 3 Ch, Sc in the next 2 Ch, Slst to the first Sc. Fasten off. Weave in your ends. Next take a small piece of black felt and cut out two 1/4 inch diameter circles for the eyes. You can sew these on or glue them on the the chick. An alternative is to us a black marker to draw on the eyes. For the beak, take a 1/2 inch square piece of yellow or orange felt. Fold the square in half to create a triangle and trim the edges to create a beak. Sew or glue this felt to the head of your chick. Now glue or sew on the wings of the chick. Now your mini spring chick basket is complete. Are you going to make a Spring Chick Basket? I would really like to see your finished piece, take a picture and share it with me on any social media! Just tag me @windingroadcrochet, #windingroadcrochet, or #ourcrochetjourney. Join my Facebook Group and share your creation with the community at Our Crochet Journey Facebook Group! Written pattern, tutorials, graphs and pdfs of the Crochet Chick Pattern are copyright Windingroadcrochet.com. Please do not reprint or repost this content as your own, but please feel free to share this link with others. You can find more information on sharing my work with others in the Terms and Conditions Page. Hi Lindsey, love the peeps but had a hard time following your pattern. I think what was throwing me off was the word turn in each row. Once I ignored the word turn , I understood what to do. I made one with your instructions and had to sew up seams. made another one w/o turning and had no seams to sew up. Took pics of both of them, just don’t know how to send to your facebook. But I also added a small feather to the tail end and it looks cute. Hope you don’t mind that I added a small detail. You inspire me . I am so glad you liked the pattern. A feather at the end would be adorable I wish I had thought of it. It is interesting that the word turn was confusing. Were you still joining the rows with a Slip stitch? I was taught to turn at the end of every round, but I do know many patterns do not have you turn and instead you work the whole project in one direction.